The Cycloneshop has closed permanently. Thanks for your patronage and requests over the time it's been open. I make various userbars, banners, spriteworks, etc. For you guys! Please look below to see what you'd like, then go to the bottom to see how to order. Gradient, lines, shine, text. But I can vary it a bit (look at the examples). Animated userbars are harder and should ideally be limited to two/three frames only. All there is to it, really. Obviously the text / colours can be different per request. Too many characters though, and it'll be too long =P I should be able to do quite a bit with this format, so request away! They would be bigger than this. 150x200 for avatars; 400x125 for banners. I also make banners and avatars of various kinds. I'm not the best at it, but I can try, if you really want me to! =P Bear in mind that none of the art is original work of mine, but the alterations and resizing, etc are mine and are what I'm doing. I find the pictures myself. But if I can't, you must supply me with a picture to use. I'll look first and tell you otherwise. If you can't find one then, I can't fulfill your request. Simple as. That above image (which you cannot use) is made of six separate images. (Normally. I can't actually fit six more images into this post D= But your one will be separate.) That means you can show six different things, with text in six different places - but the beauty of this format is that each image can link to a different place! Now, if you want one of these, you need to tell me how many, what images, what text, and where. I can also put semi-transparent lines over the images, much like CDB's "new split" style, or my userbars. So if you want that, say so. 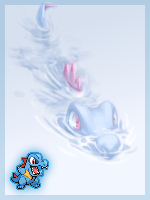 For examples of spritework check the Trinkets on GPX+ (search my name! 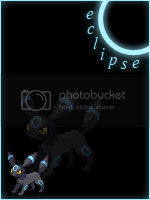 ), or my deviantART which is mainly spritework. Bear in mind that GPX+ now owns copyright to all my Trinkets. So get those yourself. Other than that, tell me to sprite something and I will have a stab at it! I don't alter other sprites, except maybe a recolour. I'm not doing trainers or stuff for you. Nothing too complex! The most typical examples of my work would be the Trinkets, and that is most like what you'll get. 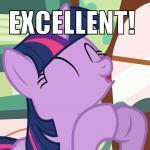 Also, you might see some lovely animated .gifs of stuff on my dA. I do not make those here. They can have hundreds of frames and are ridiculously time-consuming. But don't be put off - go ahead and request something! I'll do my best. 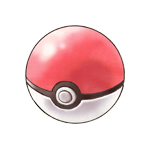 I can do you a simple Pokemon drawing, a simple Pokemon's head in a rectangle with a pattern of your choice in, or a close up of a Pokemon's head. Please do not take any of my example images and claim them as your own. Note: The sparkles are not animated. If you do use one of my images I have done for you in your signature or as your avatar, please give me full credit, as well as a link to this shop. Please note that I am pretty new to this, and if what you order turns out rubbish, try not to be too harsh. I can redo the full image if what you order is not satisfactory. 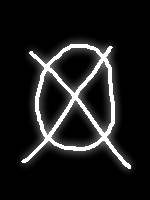 - All Cycloneblaze's work is ©Cycloneblaze except his Trinkets (which he did make, though) and most art used to make banners and avatars, which was obtained from various sources, so kudos to them. All of the Prof's work is ©Professor Mareepiea. - You must credit one of us when using our work. In your sig, or wherever. You need not link back to the shop, though it'd be preferred if you did; you can just say "______ made by <worker>" or something like that. - However, if you intend to use our work on any other site, you must link back here. That is to say you must provide a link to this shop. No exceptions. - The shop's workers reserve the right to change the shop's format / rules at any time (like adding slots). We'll put it in the title, though. - If we do not want to accept your request, you're not getting it. This in no way means you can't request something different though! - If you act like a jerk you're not getting serviced. - You can take and use the first four examples of banners (from Cycloneblaze), but you must credit him. The others are requests made for others and are for their use only. You can see them in the below posts. You may not take the examples of userbars, those are for his personal use (see them in his sig?). Just request one from him for yourself. - You may not use any of the Professor's examples, at all. They are just examples. - Cycloneblaze finds the pictures that he uses in making the banners / avatars himself, but if he can't, he will ask you to find some. If you do not, he cannot complete your request. This is unlikely, however. - You must find somewhere to host the files yourself. Cycloneblaze's Photobucket is not your Photobucket, and if he find that he has run out of bandwidth, something will have to be done. Likewise the Prof. has her own imageshack, and it is not for your use. No hotlinking! 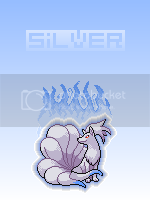 - If you request an avatar or banner with a Shiny Pokémon in it (again, from Cycloneblaze), then the finished artwork will more than likely feature a sprite. This is due to the fact that there are very few pictures of Shiny Pokémon aside from those created originally by other artists, which he doesn't like to use. 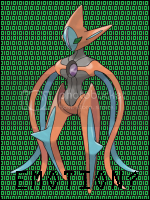 - Cycloneblaze doesn't use forms, because his art is fairly open-ended, so give him as much details as you can. If he doesn't get enough, he'll ask you for more! Simple. Just indicate first what you want, then how you want it. - The Professor does use forms, but you can just copy-paste them. They are in her spoiler. - You must give credit or you may not use any art from here. - You will not be PM'd your request - come back to pick it up. - If the shop gets popular one of us might have to start using slots. And first come, first served, even without them. - When requesting, if you could say who you want to do it that would make our lives easier. Cycloneblaze cannot really fulfill requests Monday - Thursday normally, so maybe leave it a while? But you can request during the week, you just won't get it until Friday at the latest. During school holidays he's open all week (It will denoted when he is on holidays) and he might get some done during the week nevertheless, likely on Monday. Professor Mareepiea can only draw the requests on weekends (Sometimes weekdays, but don't get your hopes up), and can only accept requests after 4:00pm (GMT+1) on weekdays, or any time she is on at weekends. Again, unless she's on holidays, which is likewise denoted up there. 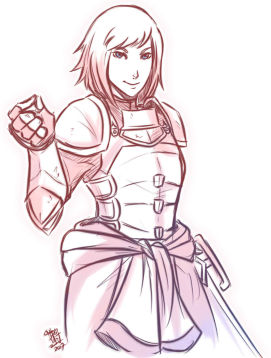 Requests might be closed if RL gets a bit mad, in which case just stare at the pretty arts until we get back. As such these rules might not apply at that time! -Requests are open all week now for me and the Prof.
-Try not to request anything too complex from the Prof.
Hi! THis store seems nice... and best of all You are a fan of Portal too! A banner with a rainbow Background. In the middle a text - Nyean Army and nyan cats arround it. Accepted! I shall see what I can do. That rainbow one might break the eyes, though. Great bro! Being the nice, helpful guy I am, I'll request a userbar off ye. It'll make a good example request, or something... Anyway! I'll take a userbar, in much the same way as your advert bar. 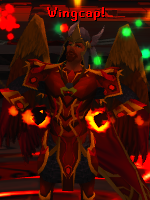 It should say 'Zamorak' and on the next line 'Your Almighty God of Chaos', with red in the centre, black outside it, a small Zamorak icon on the left, and an illuminated Zamorak book on the right. You'll know what I mean. I hope they are to your satisfaction, but if you need anything changed ask and you shall recieve. Oh, and I just realized, I said in my post that you had to supply pictures... but I think I'll change that anyways, so you get off this time. But I'm disappointed in you. It has arrived. Thank you, come again! LOL sorry...If you want I can ive you the pics now...anyway great job. Why would I want them now? I've made the banners. You're alright. Anyway, thanks for your custom! Glad you like 'em! Just credit me in your sig. Right, I'm back. Could I get a userbar like my last one, but with a firemaking Icon to the left, the text "Runescape" on the top line, Level 99 Firemaking on the bottom line, and a trimmed firemaking cape on the right? It should use an orange colour scheme. You should know what I mean. Also, can I get a banner that says Runescape, in the lower left, and an image of the Tzhaar city? That'd be great. Btw, need I images? Or will you find 'em. You need not images, but I always like it when they are provided, makes my life easier =D Or if you want a specific image, I'll need it from you. Buuut anyways, Accepted. Coming right up. Thanks for ordering, do please come again! Or if you need anything changed, say so. Oh yay I got a request! Accepted, I'll try my best at it. Here they are! If you want anything changed, do tell me so. And don't forget to credit me! 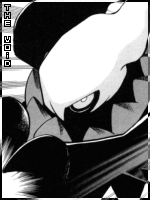 Ok, can you please do a Darkrai-themed banner with 'The Void' written across it please? XD thanks!! Now don't forget to credit me! Thanks again. Yep, it looks epic alright!! That's awesome, you're very welcome. Anyway, your request is Accepted, I'll get it right to you.